This is a 1948 photo of 7 Arts CORE members Yuri (female, center) and Bill (male, right) Kochiyama with their son, Billy. 'The first family of Asian-American activists', Yuri began her activism at Brooklyn CORE’s demonstration at SUNY Downstate Medical Center during which both her and her teenaged son Billy were arrested. Her husband Bill participated in the World’s Fair protests. Both Yuri and Bill were survivors of the Japanese American internment camps during WWII. Both also played a large role in winning reparations for survivors of the camps from the U.S. government. The Kochiyamas lived in the projects in central Harlem from the 1960's to the 1980's. They were well known for their Saturday night house parties which were attended by a who's who of activists at the time, including CORE members Jim Peck, Arnie Goldwag, Garret Morris and Frances Foster and CORE associates such as Ossie Davis and Rubie Dee. Even Malcolm X was known to stop by on one occasion. All of the Kochiyama's children were activists and worked with several Black, Latino and Asian American groups. Daughter Audee, for example, worked with SNCC in Mississippi and married a Black Panther. Another married a member of the Young Lords. 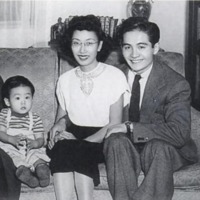 “photo of Yuri and Bill Kochiyama, 7 Arts CORE, with son Billy,” corenyc.org, accessed April 21, 2019, http://www.corenyc.org/omeka/items/show/221.